The two-day Farland Conference was opened in the Bliber Events Hall today with the opening speaches delivered by Minister József Gráf of the Ministry of Agriculture and Rural Development as well as Prof. Dr. Joachim Thomas, Chair of the Steering Committee of the INTERREG III C FARLAND. FARLAND stands for "Future Approaches to Land Development". Among the 200 experts representatives of the HUNAGI member institutions including the Research Institute of the Agricultural Economy (AKII), the Research Institute of the Soil Sciences and Agrochemistry of the Hungarian Academy of Sciences (RISSAC), Debrecen University, the University of West-Hungary Faculty of Geoinformatics, VÁTI, Capital Land Office, FAO SEUR were present. HUNAGI and the coming EUROGI-DG JRC Workshop was mentioned to Mr. Frank van Holst, Chair and FARLAND project leader as a good opportunity to articulate the strategic message of the conference to the attendees of the Rome Workshop devoted to Public-Private Partnership for Spatial Data Infrastructure in the context of e-Government. 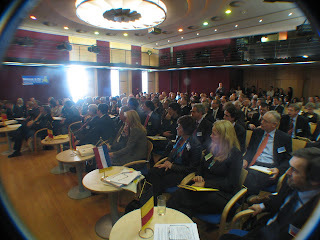 The event was logistically organised by 4CLI (www.4cli.org).